Juice blends are easy to prep, inexpensive, and delicious. We think that fresh fruit blends, made right at home, are the best option for a Paleo diet. That’s because pre-made juices are often filled with non-Paleo sugars, no matter how little is included. You don’t need to add sugar or any other sweetener to this juice blend though – the natural citrus flavors and sweetness are enough to make this a satisfying drink! We love this orange juice recipe for a few reasons: It’s easy to scale this up or down as needed; you can make adjustments to the recipe based on your taste and preferences; and, it includes yummy and nutritionally beneficial ginger and turmeric root. Fresh ginger adds a hosts of benefits to your drink, including anti-inflammatory properties which help a ton with sore joints and digestive pain. While the health benefits of fresh turmeric might be a bit overstated, this spice still has a ton of other nutrients and oxidation-prevention properties (plus, it’s just a tasty addition to your drink anyway!). Locating fresh turmeric might be a bit difficult for some; check out local Middle Eastern groceries, chain grocery stores that specialize in unique produce, and online retailers. If needed you can substitute ground turmeric, just make sure to adjust the amount accordingly. This juice is a yummy drink to add to any meal, but if you’re already planning on a big breakfast, why not whip up a batch of it to serve too? Try pairing this juice alongside a plate of egg and vegetable muffin cups for a great, on-the-go meal. 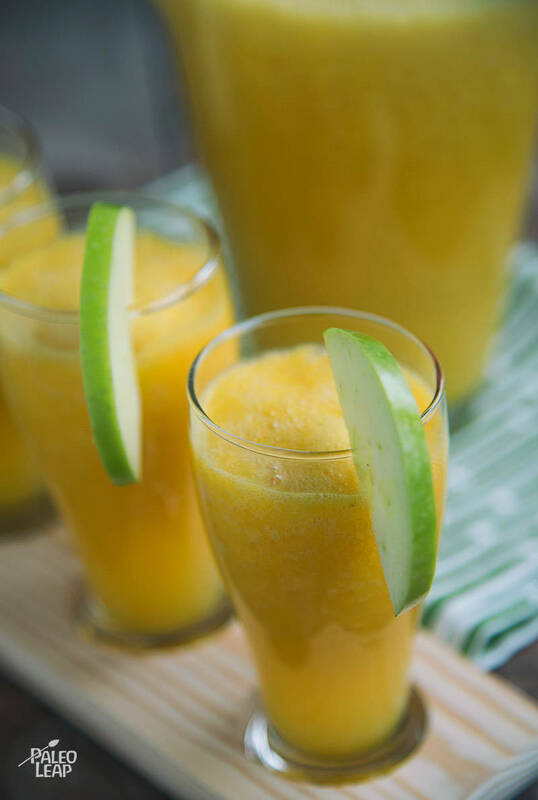 Place the apples, oranges, and lemon in a blender and pulse until smooth. Add the ginger and turmeric and give another pulse. Pour in the water and pulse until you get a smooth juice; for a smoother juice add more water.